Nancy Gilgoff is one of the pioneers of Ashtanga Yoga and the first western women introduced to Ashtanga Yoga. She began practicing Ashtanga Yoga over thirty five years ago with Sri K. Pattabhi Jois in Mysore, India. As result of their long and close association, Nancy is able to teach with a style and touch that comes directly from Sri K. Pattabhi Jois. When Nancy asked Jois how she should teach, he told her to „teach the way I taught you“ – advice which she took to heart and continues to follow today. Her home is on the Hawaiian island of Maui, where she founded „The House of Yoga and Zen” twenty years ago and where she continues to teach to this day. 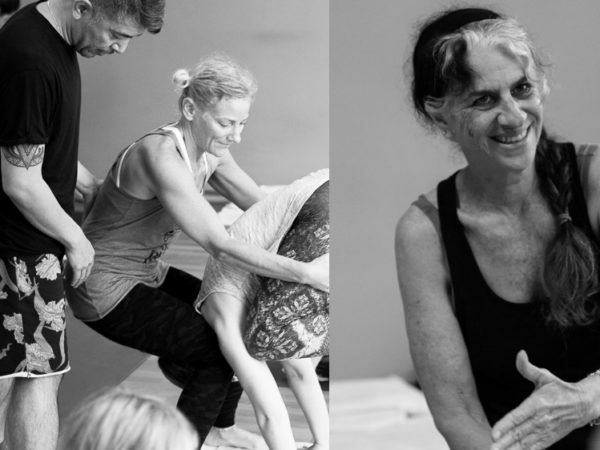 Nancy’s studies, over the years, have also led her to other teachers, including Baba Hari Das and for asana, instructors of Iyengar. In addition, she has and continues to pursue the dharma teachings of the Dalai Lama. Nancy spends much of her time touring the United States, Europe and Asia, teaching with a view to fostering loving-kindness and to share her love and experience of yoga. Mysore style practice session in the morning, with individual assistance from Nancy Gilgoff. In this Primary Series workshop, you begin to learn the principles of hands-on adjusting, of working therapeutically, and of sensing energy movement and blockage in the body. Payment of the workshop fee is required to reserve your space. It is possible to pay a deposit of 280€ to reserve your place. The rest has to be paid latest 1st August 2019. The deposit is non refundable. If you need accommodation write us an e-mail and we will send you links for affordable private rooms and apartments in the area. In this Primary Series workshop, you begin to learn the principles of hands-on adjusting, of working therapeutically, and of sensing energy movement and blockage in the body. All participants should be practicing the full primary series regularly.